I missed the old Bumbershoot comedy programming most on Monday. Usually the days are broken up by comedy shows where, in the past, I’ve seen everyone from Doug Benson to Janeane Garofalo to a variety of EarWolf live show recordings. Alas, I kicked off the last day with the 70s pop obsessed duo, Sisters (pictured above.) If you aren’t familiar, you’d probably like to have them on-deck to play between Bee Gees and “P.Y.T. (Pretty Young Thing)” at your next function. 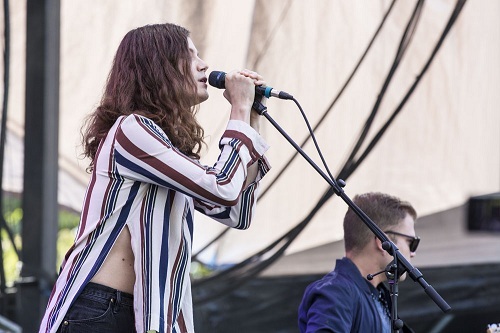 BØRNS. Photo by Sunny Martini. After finding my way to the Rhapsody Stage beer garden, BØRNS started up to basically enhance the fact that the sun was out and nobody was at work. I couldn’t pick his music out of a lineup but, in the moment, he sounded crystal clear. Let’s fast-forward to me resuming my post inside Memorial Stadium where Hozier, a literal Irish giant, sang what I can only assume to be the song of his people. He has a surprisingly rich voice and seems like a more straight-laced Father John Misty. The crowd ruled because they responded to each song as if Zeppelin were playing “Black Dog” for the first time. Ellie Goulding. Photo by Sunny Martini. I ended my eleventh Bumbershoot as the sitting Premier Bumbershoot Wunderkind with Ellie Goulding. She’s the electric-type to Hayley Williams’ fire-type, which is one of the highest compliments I’m able to make. People tend to underestimate her but she proved to be a highly capable pop act to close down the festival. Thank you for bearing with me here and see you next year!